Another Harlan Coben novel, this time in his Myron Bolitar series. Myron is a sports, literary, and actors’ agent, and for some reason he keeps getting involved in investigating crimes. This one hits closer to home than most. Live Wire begins with an appeal from “Suzze T,” a tennis star client married to a rock star. Suzze recently gave birth to a baby, and someone posted a comment on her Facebook page, saying that the baby is “not his.” Just a troll, you’d think, but now her husband has disappeared. Can Myron find him and bring him back? As he investigates the husband’s last known movements, Myron gets a look at a night club closed circuit surveillance recording, and sees a familiar face – his sister-in-law, Kitty, also once a tennis star. Myron hasn’t seen Kitty or his brother in fifteen years. Myron didn’t trust her, and made accusations. The last time he saw his brother, he broke his nose. Now he wants nothing more than to see him again and apologize. But Kitty is hard to find, and she has secrets. And then somebody dies, and the whole mystery plunges into a tangle of old and toxic secrets, while a ruthless killer lurks in the background. Of course Myron has his own dangerous weapon, in the person of his best friend, Win Lockwood. 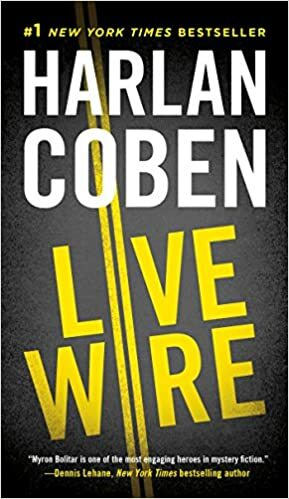 Live Wire is in many ways a heartbreaking story, well told. Coben’s usual themes of loyalty and family love are front and center. LW also serves as a launching pad for Coben’s young adult mystery series starring Myron’s nephew Mickey Bolitar. Recommended.